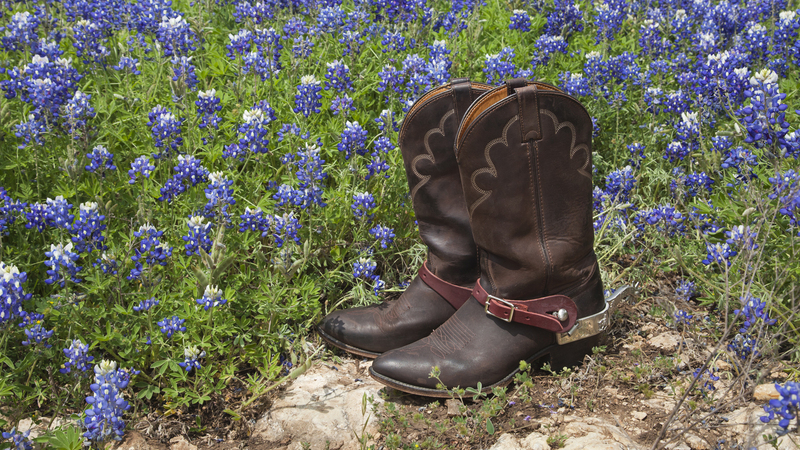 The only thing more Texan than a great pair of cowboy boots are the bluebonnets. From the end of March to early May the Texas state flower, known for its resilience and abundance, coats the landscape in shades of blue. They are everywhere! People visit from far and wide to experience this natural wonder. It’s a Hill Country springtime tradition to take a classic portrait, posed in your Sunday best among an ocean of bluebonnets. Young and old come out with friends, family, and even pets to frolic amongst the flowers. We at Harry’s Boots love wildflower season and are lucky to be located in San Saba near some of the most beautiful bluebonnet patches in Texas. So, if you’re looking for the best places to snap a photo with your loved ones this spring, we know all the best spots and tips for taking the perfect bluebonnet pic. This little town is filled with original and unique photo ops among abandoned farms, bridges, and railroad tracks. Plus, it’s on the way to Harry’s Boots hometown, San Saba! Stop on by while you are in our neck of the woods. As one of the most popular bluebonnet stops, Brenham, TX is litterally covered in the things. Giant patches can be found everywhere. There’s even a “Wildflower Watch” blog on visitbrenhamtexas.com. The people of Burnet love bluebonnets so much they throw a festival every Second weekend in April in celebration of their state flower. Here you can find bluebonnets around the Colorado River. The natural beauty of Marble falls makes an excellent backdrop to the already spectacular bluebonnet patches. Though you may be tempted to pull over when you see a nice, full patch of bluebonnets, don’t stop on the side of a busy highway. That’s a no-brainer. Plus, cars whizzing by in the background of your photos is tacky. Search the backroads or find a quiet park to have your photo shoot. Many unfriendly creatures such as ants, snakes and spiders love to make flower beds their home. Be sure to do a thorough scouting of the location before taking snapshots there. Not only are boots fashionable, they’re practical too. A tall pair of cowboy boots protects against itchy grass and flowers. And, even with a careful search for animals and bugs, they can still pop up. In that unfortunate incident, wouldn’t you rather be wearing some leather boots rather than sneakers or flip-flops? Seriously consider what you will wear. Patterns clash with a busy bluebonnet backdrop. Solid colors are the way to go. Don’t just take the standard sitting portrait. Try taking photos from above and below, near and far, and with the subjects still and moving. Variety helps find the most interesting shot.